How do you work, love, and play when you don’t have the time? In Overwhelmed by Brigid Schulte, she offers parents insights into how to find more leisure time so they can enjoy rather than merely survive their time-pressured lives. Seeing as I struggle with our modern world’s addiction to the daily grind, I was eager to read it for Parenting by the Book this April. “This is how it feels to live my life,” Schulte writes. “Scattered, fragmented, and exhausting. I am always doing more than one thing at a time and feel I never do any one particularly well. I am always behind and always late, with one more thing and one more thing and one more thing to do before rushing out the door.” If you can relate, don’t feel bad. According to Schulte, you’re not the only American feeling this way. While we’ve become accustom to multi-tasking, the research shows, “No two tasks done simultaneously,” Schulte explains, “can be done with 100 percent of one’s ability.” Still, our lives have become filled with what Schulte calls a “banal busyness” since “admitting you take time for yourself is tantamount to a show of weakness.” Is it any wonder people feel guilty about leisure time? I recently dropped my younger daughter off at a movie birthday party. Many parents chose to stay with siblings. My older daughter was at gymnastics so I decided to run errands instead. When I told the mom I was leaving, she said, “I wish I was going shopping.” I immediately felt the need to justify I was shopping for my family, “It’s only Trader Joes.” This is one of the problems with parenting nowadays. We can’t actually do something for ourselves. What if I was going shopping for me? Would that be so bad? That’s one of the things I found so compelling about this book. Schulte provides the cultural context for the ideal American worker, which isn’t a mother or father interested in spending time with their family, while also offering thorough examinations of other cultures, notably Denmark, where they have a much better handle on the work/life balance. Guilt over having chosen to work – be it part-time or full-time – is simply not an issue for parents there. As a result, according to the United Nations first ever World Happiness Report, Danish adults and children are both the happiest around. Another reason for this is that Denmark doesn’t value of “face time” the way that American employers do. They embrace the virtual elements technology affords us and focus on whether the job is done well, not where the job was done. This is not the case in the United States, and Schulte explains, “Research shows that forcing long hours, face time for the sake of face time, and late nights actually kills creativity and good thinking, and the ensuing stress, anxiety, and depression eat up health-care budgets.” Granted, Schulte acknowledges that Denmark is not a perfect society, but she does make it perfectly clear that valuing both the roles of women and men goes a long way in creating a functional and happy community. So while I was out running errands I started thinking about what Schulte believes is the purpose of her book: “This is about sustainable living, healthy populations, happy families, good business, sound economics, and living a good life.” I “allowed” myself to stop for a quick dinner at Noodles & Company since my daughter was eating pizza at the Movie Tavern birthday party. As I reveled in a bowl of Thai Curry soup, I thought about how pathetic it was that this pit stop was so restorative. But I rarely eat curry because my kids don’t like it, and it was the first meal I’d had all day. I’d driven to Old Dominion University that morning to present a teaching strategy I developed called “Rainbow Revisions” at their writing conference and traffic on Route 64, made worse by rain, meant both breakfast and lunch were eaten on the run, thanks to a stash of snacks I keep in the car. That’s when I internalized Schulte’s message: How will my children ever achieve a work/life balance if they have no one to model it for them? 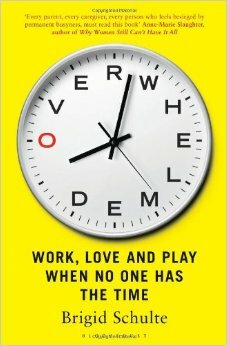 So if your goal is to work less and love and play more, then I highly recommend you pick up a copy of Overwhelmed by Brigid Schulte. It won’t change your life overnight, but it will make it easier to say “no” the next time someone asks you to bake cupcakes for school. Besides, the last thing the kids need is more sugar (but that’s a book for another day).